Usually when using fake nails I struggle to get them on and looking natural. However with these I found them so easy to apply. I was able to put them all on in under 15 minutes. The sizes were great and I didn't need to trim any down at all. They lasted longer than the ones I have used in the past too which is fantastic. I got so many compliments with these nails and was able to recommend them to many friends. Overall these look fantastic. Are easy to apply and long lasting. I would recommend these. I think everybody agrees with me that French manicure is a timeless favourite. Now with Elegant Touch you can have it in no time, ok it will take around 3 minutes. In this pack you can find 24 pre-glued artificial nails, buffer, leaflet – no separate glue required. It means there is no chance to make any mess. If you are a beginner, try Elegant Touch Pre-glued Nails, best choices are these timeless classic French nails. I always have one box in in my make-up drawer for emergency situations. ... read more These artificial nails are very comfortable and chip resistant. 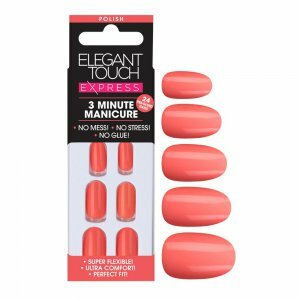 These very light, natural pink shaded transparent nails are a little thicker to help to hide your natural nails totally. But do not worry the oval shape gives a beautiful natural look. The colour is stunning without being to brash, perfect accessory for summer outfits. The simplicity of these nails require no glue, easy to apply and remove. 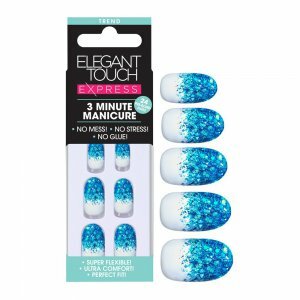 The 3 minute manicure is a must for any one not wanting to commit to long term nail care, for all ages who want their nails to look good and make them feel good about themselves. 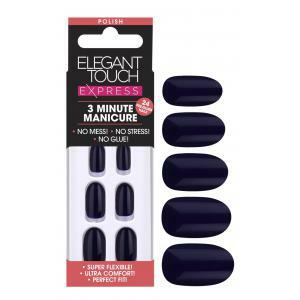 These nails are perfect for people who are not allowed to keep their nails long or nail varnish at work or school as they can be easily removed. 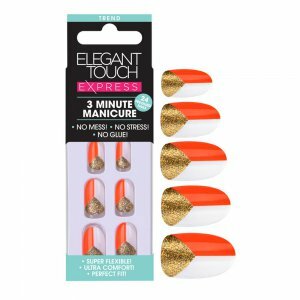 Express nails ... read more are a must have beauty accessory to keep in your make up bag for those unexpected emergencies and the beauty of express nails is teh wide variety of colours they offer so you could change your nails every day to match your outfir and mood. Easy to apply for a quick fix! If you're looking for a quick easy fix before a night out this is perfect! I love how these are curved so really do sit nicely on your fingernails! 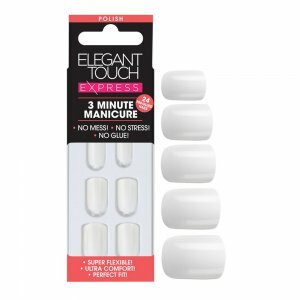 I much prefer nail glue to hold on Elegant Touch but if you're not a big fan of glue (don't want to stain your nails with it) and just want something for one night then these are perfect! 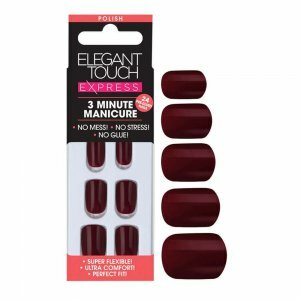 These nails give you the classic, sophisticated red talons without the hassle of actually having to first grow your nail and second actually applying red nail polish without smudging it before it dries. It litterally took me less than 5 minutes to prepare my nails and then apply the false nails. They felt secure straight away and they did not fall off until I removed them myself. I love the fact the nails are already pre-glued as it makes for a no fuss, no mess application. Big thumbs up ... read more from me for these nails. I love these stick on nails - fab for when you don't have time to glue a set on (although admittedly the glue ones last longer). I was going for a real sixties vibe one Saturday before going to meet a friend and decided on the fly I just had to have these on. I got plenty of compliments! Easiest application you could ever imagine! I absolutely adore the express range. Literally peel off the backing of each nail then press to your own nail, holding for a few seconds, to secure your new look! Called "brilliantly white", you can't argue with the description. They really are a bright white. A shorter length and squared edge, they're perfect for my shaped nails. My second kit has the name Rosie Bea Nails (Top Beauty Vlogger). Has beautiful deep marina colour. I love dark nails, so this very dark blue is one of my favourites. The colour is as beautiful in reality as on the website. It is perfect to wear for any occasion in any season. Just put it on when you like it. It goes well with any style and colour. You cannot go wrong with Rosie Bea Marina. The shape is a short stiletto, very comfortable, never makes you any difficulties in everyday life. The ... read more kit contains 24 nails in 10 sizes, glue and mini buffer. Very easy to attach and lasts quite long. I love the dark navy colour of these nails. It's very wearable and great for an everyday look. I also love the shape which is a easy to wear shortish stiletto shape. So nails were very comfortable to wear and added a nice polished touch to my nails. 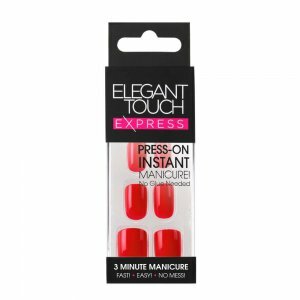 They were east to apply and came in good range of sizes, which can be filed down to suit your nails. They were so comfortable that they just felt like my natural nails. These nails would suit everyone as they are such an easily to pull of colour and shape. Easy application and looks amazing! The colour of these is something else. It's almost a metallic colour and they shine when the sun catches them. Application was the easiest. I was in awe of how well they stayed on, I got 3-4 days out of these. I could have got longer if I popped a little glue on. They were not risen either from my nail bed, they looked rather natural. Colour stayed and felt good on my nails. No tugging or heavy feeling. I Love these pre-glued nails! 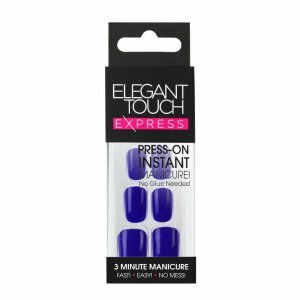 They are a great and easy option to have great looking nails in just a few minutes. I used to only use false stick on nails when going on a night out but these nails stay on so well that I now like to use them anytime even when not going out. They are a great colour and have a lovely professional finish. I really am shocked at how well these pre-glued nails stay put on me as I have a dog and 3 kids so they go through quite a rigorous test with me. You get everything ... read more you need in the pack with the nails from the prep wipe to the mini emery board so your good to go in minutes.